As promised, it’s time for burgers. Burgers may be my favorite meal. In Portland, I did a pretty good job of maintaining at least a burger a week habit, and before we moved to Davis, I made a bucket list that was largely driven by a desire for burgers I’d heard about but hadn’t had yet. 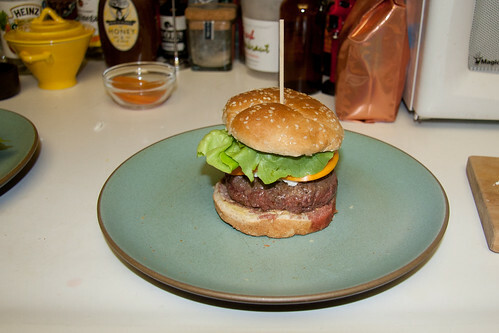 Over the last couple years, I’ve tried to perfect my technique to deliver my ideal, medium-rare burger. We recently joined a meat CSA called the Foragers. Each month we receive a mix of beef, lamb, and chicken. 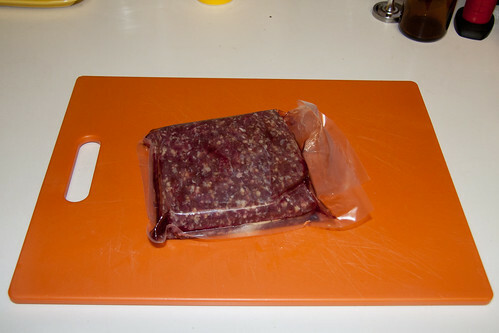 We invited a friend over, and busted out a one pound package of 85% lean ground beef. 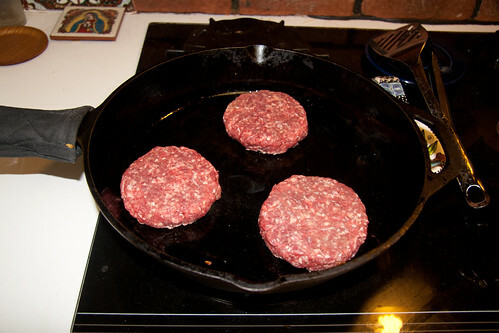 I’ve found that 1/3 pound burgers are the perfect size—meaty and filling, without being overwhelming. I generally prefer something closer to 75-80% lean beef, but I’m not too picky, as long as it isn’t very lean. 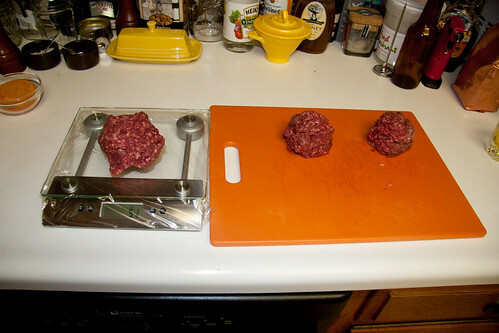 I divided the beef into equal portions and formed some thick patties. 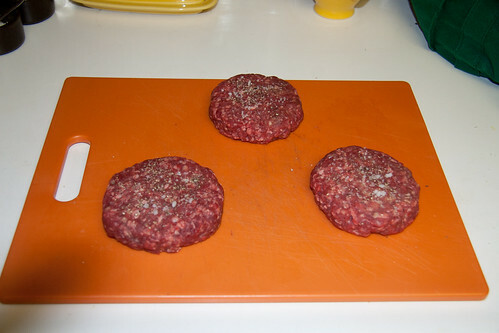 Then I pressed some salt and pepper into each side of the patties. 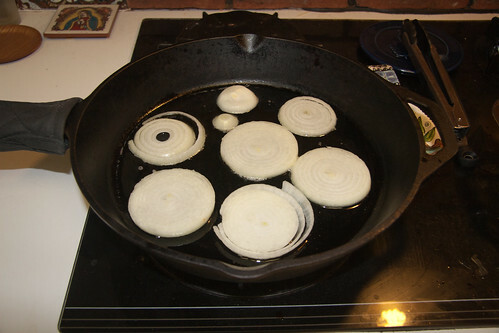 I put some bacon grease in a cast iron skillet and sautÃ©ed some onions. When the onions were done, I put the burgers in. I use a frequent flipping method, flipping every minute. As detailed by A Hamburger Today, this method helps retain moisture and reduce the ratio of overcooked to medium rare meat. I find that nine minutes is about the perfect cooking time for medium-rare. 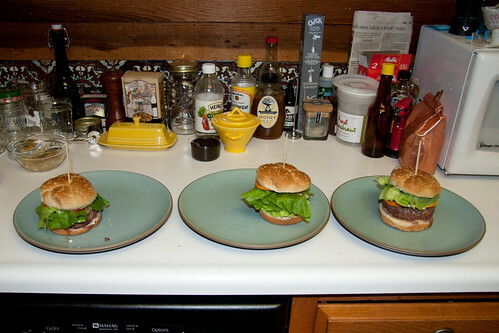 When they were done, I removed them to the buns. I like mayo and a bit of dijon on mine. 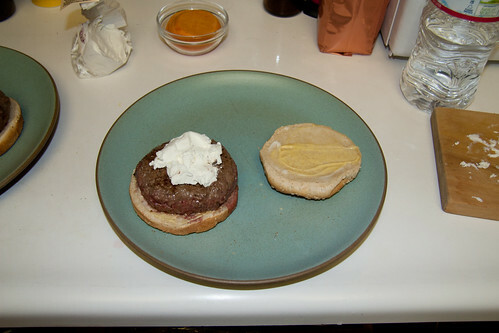 I added a nice dollop of chÃ¨vre to the burger. 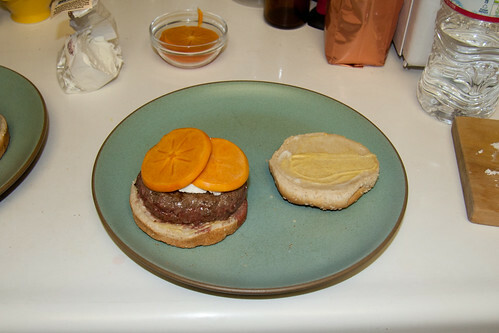 Since tomatoes are very out-of-season, and persimmons are very in season, I added some sliced Fuyu persimmons. 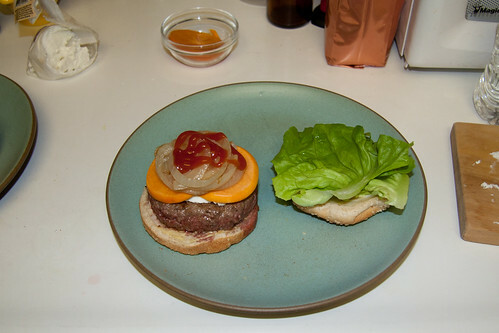 Finally, I added some butter leaf lettuce and the sautÃ©ed onions. Everyone got to make the burger the way she liked it. The goat cheese and persimmon were a killer combo, a little sweet and much better than a December tomato would have been. Though I enjoy a wide variety of cheeses on my burgers, I’ve found recently that soft cheeses, such as chÃ¨vre or bleu cheese, added after the burger is done cooking, are really doing it for me. All the photos are here.